There are some tracks that if they were characters, you wouldn't want to bump into them down a dark alley. They are like something from a Stephen King novel. 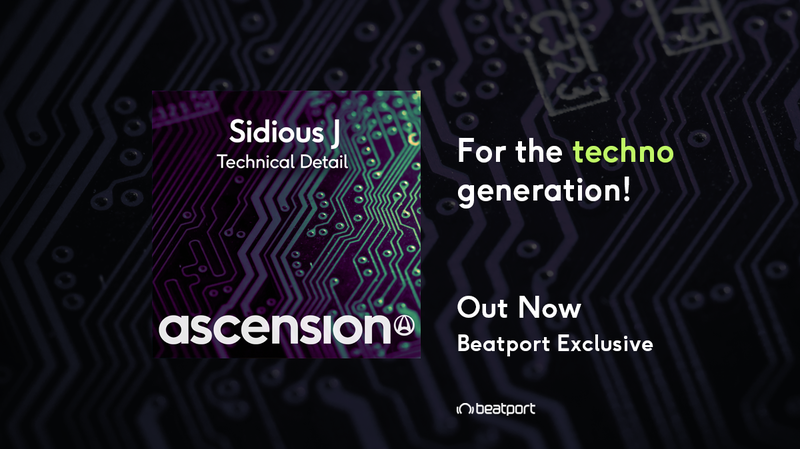 Hailing from the hills of Ayrshire, Ascension® Music welcomes the sinister sounds of Sidious J.
Fuelled with audio anarchy, Sidious J is the brainchild of Public Domain producer James Allan, taking a side tour down the underground techno route. His debut Technical Detail is a full on, dark, driving techno monster of a track with a real edge. Laden with heavy basslines, spacey synth bleeps, haunting vocal shots and a chunky percussion, Technical Detail is a twisted infusion of modern techno and tech house, taking the listener on a mesmerising trip to Wonderland and beyond. John Gibbons 9/10 "Big Tune". Nick Larson "Awesome tune. Up in my next podcast". Dancing Astronaut "The most decent techno I've heard submitted to us by a long shot". River Beats "This is the song you would hear as soon as you walk in to a warehouse full of Techno-enthusiasts dancing their butts off".